If you are experiencing pain related to your daily activities or have had an injury, you want to feel assured you are seeing the top-rated orthopedic surgeons in Denver. When you choose an orthopedic specialist at Presbyterian/St. Luke’s Medical Center, you or your family member will be evaluated and treated by some of the most experienced and exceptional bone and joint care doctors in the region who are experts at diagnosing and treating any orthopedic condition. For more than 30 years, the Institute for Limb Preservation has established itself as the Rocky Mountain region's premier medical group to evaluate and treat diseases and trauma that affect the extremities. This highly esteemed team of experts works collaboratively on the most complex cases, such as the treatment of bone tumors with intra-arterial chemotherapy and growing prosthesis. Our Denver-based orthopedic surgeons and doctors are extensively trained in treating a wide range of conditions and injuries. Whether you are seeking care for your symptoms with any of our hand, hip, foot or knee doctors, The Denver Clinic at Presbyterian/St. Luke’s Medical Center is home to experienced orthopedic specialists. Often, ligament and tendon injuries are associated with some type of sports activity but ligament tears can also occur during what people might call more ‘routine’ activities. Whether you experience an injury while playing in the annual Thanksgiving flag football game, or by reaching overhead for something on the top shelf in your garage, you want to be treated by an expert in this type of injury. Through a thorough exam, in combination with advanced imaging, they are able to diagnose the problem and work with you to decide on the appropriate treatment plan. If surgery is necessary, the surgeons are board certified in orthopedics with advanced training in arthroscopic repair of ligament injury. Arthroscopy is a short, minimally invasive procedure, which utilizes a small camera system and instruments to visualize and repair the affected joint such as knees or the shoulders. Arthroscopy is typically done to remove cartilage, repair soft tissue tears, remove the joint lining, improve instability and for the early treatment of arthritis. Due to the less invasive nature of this procedure, it is usually done on an outpatient basis. One of the most common procedures involving arthroscopy is hip arthroscopy and labral repair. Most patients can walk using crutches one to two weeks after the procedure while undergoing six weeks of physical therapy. Each patient’s healing experience is personalized, so our team will recommend the best treatment option for you, so you can heal as quickly as possible. Traumatic injury to the extremities often results in severe fractures of one or more bones. There can be a single fracture (break) in the bone, or the bone may be shattered into numerous pieces (comminuted). In addition, the fracture may be closed or open—meaning there is an injury to the surrounding soft tissues and the bones are visible. 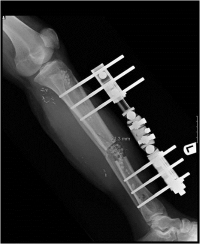 External fixation involves placing pins in the bones on each side of the fracture from outside of the injured extremity (the pin is exposed through the skin). The pins are then connected with a rod that is outside the extremity as well. Internal fixation is used when the fracture can be realigned and a plate with screws or an intramedullary rod can hold the bones in alignment. 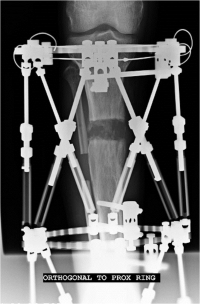 A ring fixator or Taylor Spatial Frame is another option for fracture stabilization. This device is often used if there is a deformity to correct or if there is bone loss that is not addressed with allograft bone or vascularized bone flaps.